In addition to this straight talking of the talk, the Trump team also walked the walk—and just this week, by tightening the sanctions against Cuba’s military and secret police robber-barons. 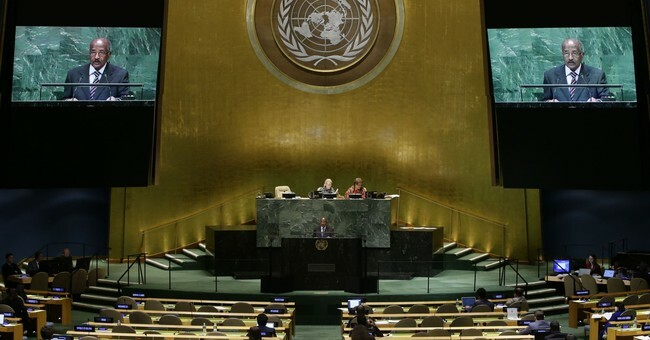 For the past 28 years at around this time members of the UN vote ritually, and almost unanimously, to condemn the U.S. for our (so-called) embargo of Cuba. Ritually only Israel votes with us during this charade—and two years ago Obama actually instructed his UN ambassador to “abstain” (a polite way of joining in the condemnation) from voting. You read right. On orders of the former president of the United States Barack Obama, the United States (essentially) voted against itself at the UN! But let’s shovel away the mountains of classic United Nations BS and define this annual UN charade properly: the world’s biggest burglar (the Castro-regime), along with its enablers and sap burglary-victims (most UN members) all throwing a tantrum against the one nation on earth that has steadfastly refused to be (further) burglarized by the world’s biggest burglar (the Castro-regime). In other words, quite recently The Castro-Crime-Family officially fleeced Spanish taxpayers for another 46 million euros. I say “another” because barely a couple of years ago the Castro-Crime-Family stuck it to Spanish taxpayers for an earlier $1.88 billion! The Castro Crime Family has gleefully fleeced taxpayers from the European Union to Canada, from Mexico to South Africa—in brief, the taxpayers of virtually every nation whose government granted trade credits to these kleptocrats—in brief, to the taxpayers of virtually every nation whose government refrains from “embargoing” the Castro-Crime-Family. The Castro crime family stuck it to Mexico again four years ago, when its state development Bank Bancomex (Mexico’s version of our Ex-Im Bank) wrote off almost $500 million Cuba owed them from 15 years back. The Castros stuck it to Europe back in 1986, defaulting on most of their debt to the Paris Club. Fifteen years later the Castros stuck it to French taxpayers again for $175 million. Recently Europe’s “Paris Club” of Cuba creditors finally wrote off $11 billion the Castro Crime Syndicate (called “Cuba” by the media) stole (called “loaned” by the media) from them. All of those Castroite burglaries are on top of the $30 billion in Castroite debt Putin’s Russia “wrote-off” just two years ago. So, amigos, when you hear or read the usual claptrap in the Fake News Media about the “Cuba embargo” simply replace that term with “trade credits from the U.S. taxpayers to the world’s biggest deadbeat/crooks” and you’ll get to the essence of the issue.